Did you cut your dogs nail too short? 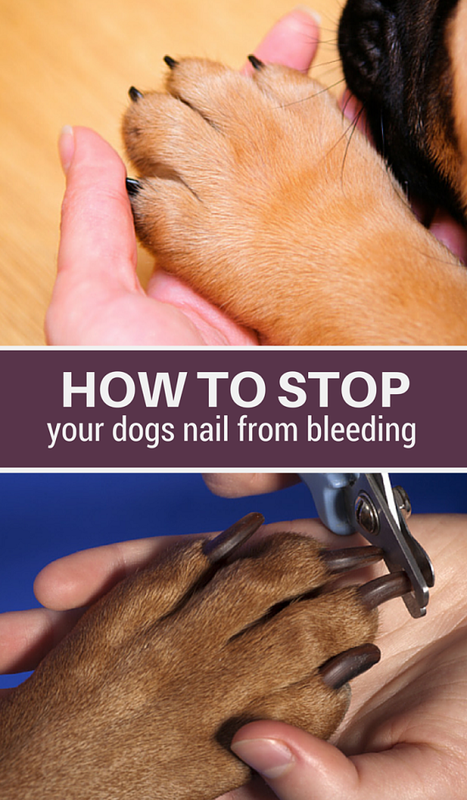 Do you need a way to stop your dog’s nail from bleeding? It’s a common hazard when trimming your dogs nails, but luckily there are a few easy solutions to make the bleeding stop. While it might take awhile to regain your dogs trust when it comes to trimming his nails the wound itself can be easily treated at home. From using styptic powder to baking soda, here’s 5 easy ways to stop your dogs nail from bleeding. The first thing you need to remember after you cut your dogs nail too short is to remain calm. You’ll know you’ve cut too far immediately, your dog will likely pull away from you and let out a yelp. If you panic you’ll make your dogs fear worse, so try to remain calm. The bleeding is going to look much worse than it actually is. The calmer you remain the calmer you can keep your dog. Most nail trimming accidents are minor and can be treated at home. If you have another person available enlist their help; another set of hands will make the process much easier. Nail trimming accidents happen, and they’re very common among dogs with dark colored nails where the quick isn’t easily visible. 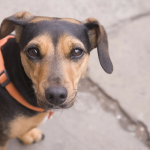 Styptic powder is the most common and efficient way to stop a dog’s nail from bleeding. It’s what veterinarians and groomers use to treat minor cuts and to stop bleeding. It contains Benzocaine which works as a topical anesthetic to help ease pain, and ferric subsulfate which helps to stop bleeding. To use styptic powder you can either dip your dogs nail directly into the powder or use an applicator. When using an applicator such as a swab or q-tip be sure to apply moderate pressure to your dogs nail for a few minutes, or until the bleeding has stopped. Styptic powders or styptic pencils are antihemorrhagic agents that work by contracting blood vessels. Styptic powder helps to clot the blood and can help prevent bacteria from entering the bloodstream. If you don’t have any styptic powder on hand it’s not a bad idea to pick some up next time you’re at the pharmacy or pet store. Styptic pencils are commonly available near the shaving section in pharmacies since they’re also used to treat shaving injuries and minor cuts. If your dog is calm you can dip your dogs nail directly into the powder. That will cause the bleeding to stop almost immediately. If your dog won’t let you handle his nails after a trimming accident you can use the application method mentioned above. Just be sure to keep moderate pressure applied to the nail for at least 30 seconds when using an applicator. Styptic pencils are available at most pharmacies, and they’re usually located in the shaving aisle. They’re nice to have on hand for treating minor cuts and stopping your dog’s nail from bleeding. A word of caution when using styptic pencils: many contain silver nitrate which will sting on contact. 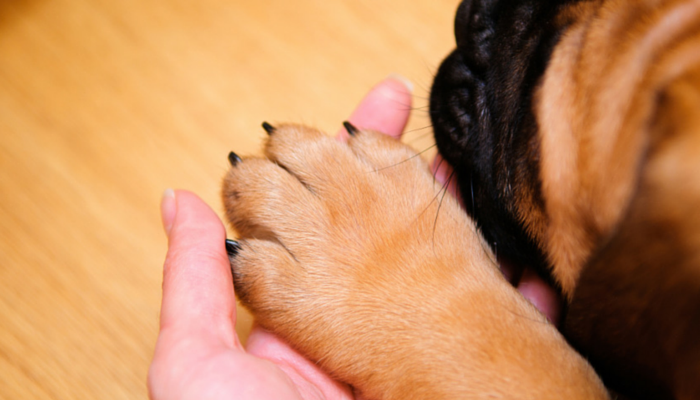 Expect your dog to show discomfort when it’s first applied to their nail. And remember that silver nitrate is messy stuff. It will stain your skin, carpet, and counter tops so use with caution. 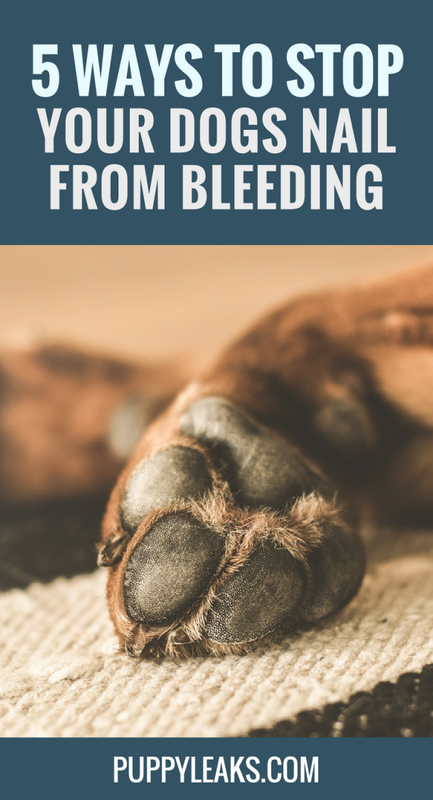 With any of these methods the most important thing to keep in mind is that you need to keep solid pressure on your dogs nail while applying the solution. These methods work, but they don’t stop bleeding instantly like styptic powder. For them to be effective you’ll need to apply moderate pressure for a few minutes. One home remedy to stop your dogs nail from bleeding is to use flour, baking soda, or cornstarch. You’ll need to thoroughly cover your dog’s nail with it, and then gently compress their nail with a towel or cloth until the bleeding stops. 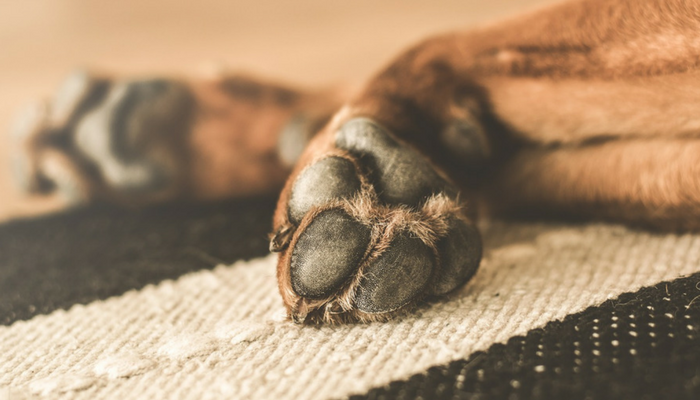 If your dog isn’t a fan of having their nail dipped you can use a cotton applicator to apply the flour, baking soda or cornstarch onto their nail. If the bleeding doesn’t stop right away put some more on their nail. Don’t wipe off your dog’s nail between applications; the flour, cornstarch or baking soda that is on there will help aid in coagulation. 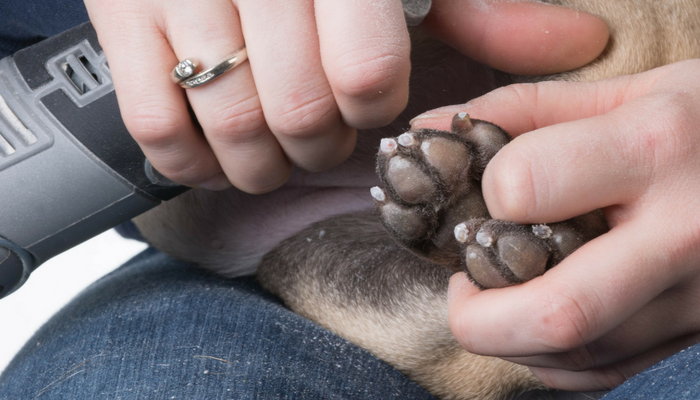 Gently compress your dog’s nail with a paper towel or cloth until the bleeding stops. To get your dogs nail to stop bleeding with a bar of soap you’ll want to first soften it up by getting it wet. After it’s a little mushy you’re going to place your dogs bleeding nail directly into the soap and apply pressure for a few minutes. If you don’t want to push your dogs paw directly into the soap you can break off a piece and wrap it in a towel before applying. Be sure to keep firm pressure for at least 3 minutes to make the bleeding stop. When you suspect that the bleeding has stopped take a quick peak first to ensure that it’s worked. Clipping your dogs nails should be part of their normal grooming routine. If you’re not comfortable using guillotine style clippers try using a dremel tool to sand your dogs nails down. After the initial bleeding has stopped it’s important to keep your dog off his feet for at least 30 minutes. Try giving him a stuffed Kong to keep him occupied. Keeping him off his feet will keep him from re-injuring the nail. If you have bandages it’s a good idea to wrap your dogs paw to help prevent further injury. Most nail injuries are minor and will stop bleeding within 20 minutes with these home remedies. The blood loss, although it looks terrible, is usually minimal and there’s little risk of your dog losing too much blood. The above solutions work for minor nail cuts. If your dogs nail continues to bleed for more than 20 minutes it’s time to call your veterinarian. Nail bleeding occurs when you cut your dog’s quick. If you want to avoid accidents when trimming your dog’s nails it’s important to know how to identify it. The quick in your dogs nail is the cuticle-like part in the center that’s rich in nerves and blood vessels. Since it’s filled with blood vessels it’s going to bleed a lot if you cut into it, and your dog will likely let out a yelp. 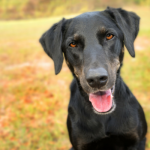 The quick can be hard to identify in dogs with dark nails. You can avoid accidents by trimming small pieces off at a time and stopping as soon as you start to see a whitish-grey circle (the quick). Identifying the quick in a dogs that have white nails is usually easy because the pink is easy to see, but with the black ones it’s a real challenge. If you take a look at a white nail on a dog or cat you’ll see a dark smaller part on the inside – that’s the quick. That’s the part you want to avoid trimming. But if you have a dog with black nails you’re probably not going to see any of the quick until you actually start clipping. 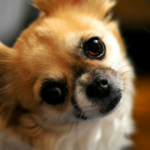 To help avoid cutting your dogs quick start with small cuts and examine your dogs nails. Once you start to see a whitish or grey circle in the middle that means you’re getting close to the quick. If you’re not comfortable with trimming your dogs nails you can try using a dremel rather than a guillotine style clipper. The dremel has different speeds and lets you trim nails without worrying about clipping off too much. 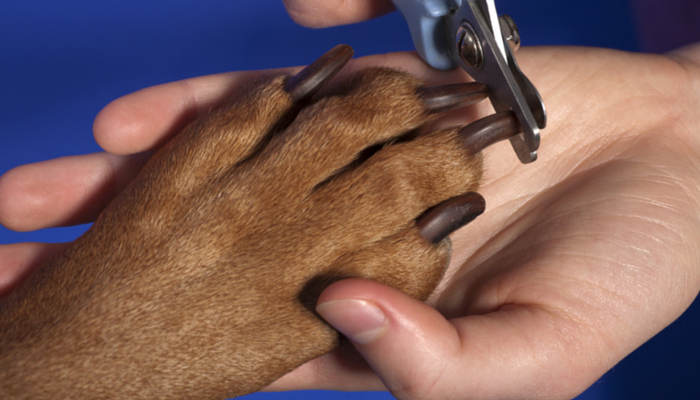 Keeping your dogs nails trimmed is an important part of grooming. 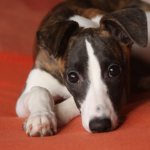 Long or overgrown nails can lead to discomfort and posture problems for your dog. It might take awhile for your dog to get comfortable having his nails trimmed again if you’ve cut into their quick, but they will forgive you. Be sure to give him lots of treats and praise every time you get out the nail clippers; that will help make the experience more positive. My dog was very nervous with nail trimmings when we first got her, so I made desensitizing her to the process a priority. Three times a week I’d get out a bunch of treats (carrots or apple slices) and slowly get her used to having her nails trimmed while handing out treats. Eventually she started to associate the nail clippers & dremel with yummy treats. Here’s a video that demonstrates how useful clicker training & positive reinforcement are for getting your dog used to having their nails trimmed. Although trimming your dogs nails is never fun it is part of a healthy grooming routine. There’s no set rule for how often to trim your dogs nails. Trim them as often as it takes to prevent their nails from touching the floor when they’re standing. 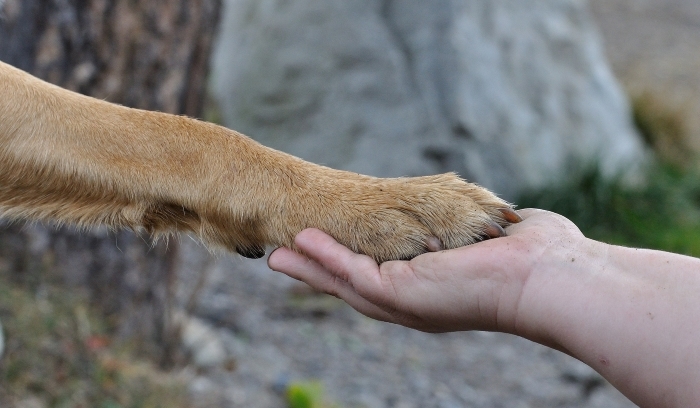 Long nails can be painful for your dog, and they can make it harder for your get a grip when walking. Some dogs are more challenging than others when it comes to getting their nails clipped. If you’re uncomfortable trimming your dogs nails or it becomes too much of a challenge you can have it done at your veterinarian’s office or the groomer. If you want to do your dogs nails on your own but hate using clippers try a dremel tool. They grind nails down rather than clipping, making it much easier to avoid any accidents. I am not a veterinarian. This advice is for the treatment of the minor bleeding accompanying cutting your dogs nail too short. If you have any concerns or if your dogs nail bleeds for more than 20 minutes please consult your veterinarian. Pinning this! I am lucky that Luna has both clear and black nails, so we cut the clear ones first and then base the black ones off the clear ones. I’m still always worried about cutting the quick! Thanks so much. I wrote this post because I still feel terrible about the time I cut my last dog Carter’s nail too short – it was horrible and I really didn’t know what to do. His nails were all black so it was always a dreaded experience. Laika has the black and clear nails like Luna – at least it makes it a little bit easier to have a general idea of where the quick is. It’s always nerve wracking though. Very helpful information. when I was cutting my dog’s nails accidentally got the quick. Is it normal that they continue to lick their paw after that happens? I’d say it’s normal. Dogs have a tendency to lick wounds or any areas where there’s discomfort. Excellent advice! I’ve made Sampson bleed before and I felt horrible. I have Styptic powder and use a Q-tip to apply it. Generally I open the powder before I start and stick the Q-tip in my mouth, that way, for me I prefer to be prepared and toss a Q-tip out, then be frantically trying to assemble the things I need. great post, never heard of the soap, great idea! I always tell people cornstarch. I did it to our beagle Kobi, but it didn’t seem to hurt. He ran all over the house bleeding, because he knew this meant he would get a treat! I had a styptic pencil and it didn’t work that well for me (I keep the powder on hand now). I had to call the vet who told me to squeeze the top of his toe to stop the bleeding, but by the time I got off the phone it had stopped anyway. I’m very conservative when I clip their nails now, so I have to do it a little more often. I’m very conservative as well since I did it to my last dog Carter – I’ll only do little tiny pieces at a time. Sorry to hear the styptic pencil didn’t work very well for you; I have the powder on hand as well. Great tips. We have used soap and it does work well also on a cracked and bleeding nail. I’ve never heard of the soap method before, but that’s a good idea. I also like Jodi’s advice about having everything on hand and ready. I only cut Haley’s quick once (one of her black nails), but I had to run and get supplies to deal with it. Luckily, I only nicked her quick and the bleeding was minimal. My tiny chi just had a bath and as usual, the nails are next. I cut too much because she’s squirming, poor babe, n although I quickly grabbed readily available baking soda, cotton balls and applied pressure, the bleeding continued. I keep disposable rubber gloves for cleaning in the bathroom and I packed the thumb with baking soda, stuck her paw in and tired up the rest like a soft cast using the rest of the glove, tiny rubber bands which are not too tight and gauze tape. I’m now just hanging out with her giving her a gazillion kisses and keeping the pressure applied and will do so for about an hour cuz the bleeding wasn’t stopping with the cotton balls n baking soda. I’m not taking any chances. Thank you. Necessity and love:The mothers and fathers of invention. I tried everything on my mini schnauzer. Finally I dipped his nail in tea tree oil and it instantly stopped! Good healing properties and pain releiver as well. That is totally awesome to know! I sell doTerra and I have that oil but couldn’t find quick enough a site to tell me which oil to use. It just happened! So if it starts again I will use that oil! Thank you so much!!! Thanks for the information, my dog had such troubles a wee ago but I did something and somehow but then I thought to read on this and got your this article, which is really beautiful. I am writing again here just to tell you that I followed and implemented your guide and found it worthy, helpful and working. Now my dog’s nails do not bleed anymore because I followed your this guide which one the best article I read so far. Thanks for such a wonderful post, please keep writing the good stuff. Unfortunately those negative associations are very hard to change. It’s not impossible but it takes a lot of patience. Since it’s so stressful right now I’d consider doing one paw a day and keeping it as positive for them as possible with treats and praise. Since they’re already nervous it’s hard to get through a full trimming at one time without them feeling overwhelmed. I’d try switching their treat to something of higher value; bits of chicken work really well for my dog when it comes to getting her to relax in super stressful situations. Be generous with those treats to make it a positive experience for them. Switching the tool itself can make a difference. If you use guillotine style clippers you could try using scissor style ones. (the scissor ones seem to give much better control as long as they’re kept sharp) If the act of clipping your dogs nails is making you nervous you can try switching to a dremel. I never felt like I was in completely control with clippers (they get dull etc), but with a dremel you’re in better control of how much gets clipped (grinded) at one time. If you do use a dremel you’ll still have to work on getting your dogs comfortable with it though; the noise it makes can be off putting. In the meantime if her nails are so long that they’re causing discomfort you may want to take her to the vet for a trim since it doesn’t sound like it’s going to be easy for you to get to all of them right now. Always used sugar as it works really well. We also use sugar and indeed it is best for me ! Great information. I have never thought of using soap before. If they do hit the quick when clipping my dog’s nails I will try this. I suggest nail clipper with a quick stopper. It has a guard that only lets you cut so far. Also make sure your blades are very sharp. Depending on how many times you use them, get a new pair every few years. The sharper the easier it will go. I cut my poor Penny’s quick with the scissor style clipper with stop guard – brand new. Was beside myself and only had baking soda on hand. It didn’t work for me, probably because she wouldn’t stay off of her feet or let me apply pressure. She was just too guarded. Luckily a neighbor had some powder and I think that has done the trick. So heartbreaking to cause my baby pain!! After 4 yrs. of trimming my dogs nails….it happened! When I saw the blood I went into shock and was not prepared. I’ve learned a lot from all the comments. New motto “Be Prepared 1st. I was so nervous and hurt that I clipped my dog’s nails and one started to bleed. I didn’t know what to do. My instincts was to apply pressure . I wiped the nail clean and read about home remedies to use. I got the corn starch and impacted the nail with the starch. I repeated this several times. It stopped bleeding and did not soak through the corn starch. I think I’ll leave the clipping to my groomer and I will be trained before attempting this task again. Me too. It just happened about 30 min or more and im never clipping them again. Taken them to the vet. I have a rescue cocker of undetermined age. (5-6). She is being treated for glaucoma and adolescent cataracts. Other than that she is the perfect dog. As a result of her limited sight (mostly shadows)it’s difficult to come up with activities that challenge and exercise her. We do a lot of tennis ball wrestling in her bed but she gets bored. I walk her about 3-4 times per day. Any suggestions for keeping her active while being blind? As far as some added mental stimulation I’m a big fan of food dispensing toys like the Bob-A-Lot or Kong Wobbler. You could also stuff a Kong with some yummy treats; I like to fill mine with some peanut butter and freeze it for a few hours because it keeps my dog busy for along time (30+ minutes). Thank you so much for this!!! I have 2 other full grown Pitbulls, MaryJane is 4 and Sonny is 2 and Lucy, my youngest at about 3 months old and i have NEVER clipped the quick until about a half hour ago. Poor Lucy!!!! She bled for about 10 minutes but was so fixated on the peanut butter stuffed bone i gave her that this bothered me more than her!!! Even after i cut it too close, i hugged her really tight and she showered me with kisses; almost as if to say “it’s okay, Mom, i know it was an accident.” She’s not limping or anything but man did i feel bad. Anyways, its nice to know I’m not the worst dog parent in the world by having accidentally done this. Haha Happy Holidays everyone!
. My husband said he would pay and take her to the vet . He was more upset than I was. I ended up wrapping it with gauges and put pressure on it .it took 20min . I’ll leave to the pros.